Creating a custom TMD treatment plan is the first step to finding relief after diagnosis. Each patient is unique, and treatment options can range from using heat packs to having surgery. One option that can benefit most TMD patients is physical therapy. Like other joints in the body, the temporomandibular joint is often responsive to certain physical therapy exercises, particularly if TMJ pain is the result of an injury. Keep reading to learn more about how physical therapists and dentists are working together to help patients, and how the latest advances in PT offer relief. If your dentist finds that stretching and strengthening the temporomandibular joint will improve symptoms, this is when physical therapy comes into play. More and more dentists are beginning to work with specialized physical therapists in order for patients to get effective treatment. Physical therapist Jeff Humphrey says this team effort leads to TMD symptom improvements in up to 85% of cases. Working with a physical therapist who understands TMJ treatment is crucial. While most physical therapy education programs will cover the TMJ, the extent to which it is covered varies. Good physical therapists now know that there is a relationship between the teeth and neck areas. This is something that many TMJ dentists understand, but they don’t have the training to provide patients with the necessary physical therapy treatments. When dentists and physical therapists work as a team, the dentist can explain the underlying conditions and problems associated with the TMJ so that the therapist can create custom exercises. For the best results, dentists and TMD patients should prefer to work with PTs that are knowledgeable in Cranial Facial disorders. The goal is to improve alignment as well as mobility through manual therapy and exercises that reduce the load on the TMJ, increase flexibility and strengthen the muscles. If the patient has suffered from an injury or has had surgery, physical therapy can be used to release scar tissue. Ultrasound and electrical stimulation tools are also being used to help reduce pain for some patients. Transcutaneous Electrical Nerve Stimulations (TENS) utilizes mild electrical currents that are passed through the skin over the jaw muscles. It can help to block pain signals, increase circulation and relax the muscles. 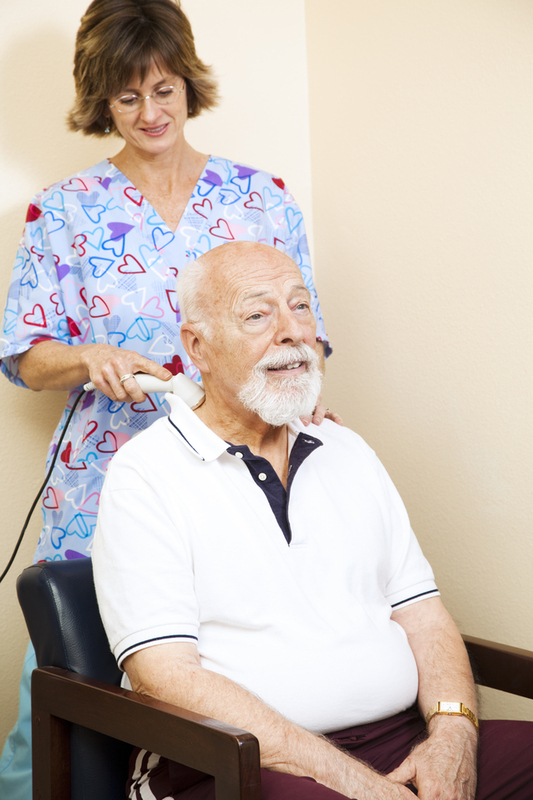 Ultrasound Therapy directs high frequency sound waves at the temporomandibular joint. The sound waves can help to reduce swelling, improve circulation and decrease pain. It is now well documented that physical therapy can have a profoundly positive impact on TMJ disorders when the physical therapist is properly trained. Organizations like The Physical Therapy Board of Craniofacial & Cervical Therapeutics are working to improve treatments and expand education for therapists across the country. Physical therapy is just one of the many solutions that the dentists at MedCenter TMJ recommend for their patients. Using advanced technology for TMJ disorder diagnosis, our team is able to identify the underlying causes of TMD symptoms. This helps to create a customized treatment plan that addresses all problems so that patients find relief. To schedule an appointment, call us today or use the convenient online patient form. This entry was posted in Dental Technology. Bookmark the permalink.